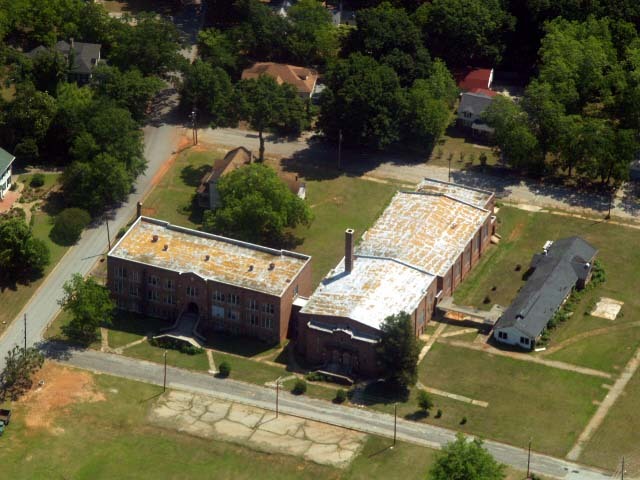 ﻿This 2008 aerial photo of the property shows the classroom building on the left, auditorium and gym in the middle, old cafeteria on the right, and the "teacherage" residence in the back left corner. ﻿ Main entrance hall - middle floor of the classroom building. Note the dried, flaking paint, which is typical in unused buildings. Wall, however, are intact and solid. ﻿The 700-seat auditorium has one of the larger school stages in the state, supposedly holding 200 performers! We're not sure that was ever tested but we're willing to try it if we can return the facility to use. ﻿Sadly, the gymnasium no longer looks even this good. The roof needs to be completely replaced and rain has heavily damaged the flooring.